Created by writer and artist Martin Eden, Spandex charts the adventures of a group of Brighton-based gay super-heroes, doing battle with 50-foot lesbians, a group of deadly pink ninjas, and their own complicated love lives. Meet the superhero team Spandex; the glamorous transvestite super-hero called Liberty, a powerful lesbian named Diva, a beautiful French teleporter known as Indigo, Prowler who absorbs the abilities of gay people, Glitter with the ability to transform himself into light, and a rock hard pair of twins: Mr Muscle and Butch. Chock-full of humour and drama, romance and action, Spandex is a super-hero story like no other. This is the very first collection of the self-published super-hero story that took the indie comics community by storm; nominated for the ‘Best British Comic’ at the prestigious Eagle Awards, the comic has received excellent reviews and critical acclaim. Spandex: Fast and Hard collects Spandex #1–3, and includes a bonus afterword and character biographies with commentary from Martin Eden. I had the opportunity to chat with Martin about the comic, his influences and more! What was the genesis of Spandex? I’d been working on my previous O Men series for about 10 years and felt like I wanted to do something new. In the meantime, some undeveloped supporting characters in the O Men were starting to grab my attention and the idea of an all-gay superteam entered my mind. I decided to go with that idea, and then it kind-of became a race to do it before someone else came up with the idea! It’s obvious from reading the book that you were influenced by the soap opera team dynamics of both The New Teen Titans and X-Men comics of the Eighties. Was it your intent to make Spandex a love letter to that style of comic and did you feel a responsibility to represent various members of the LGBT community as opposed to focusing on say, a single gay hero? Yeah, I loved all those 80s/90s comics – they had a huge influence on me. They don’t make comics like those any more, so this is what I tend to do – I create a comic that I’d like to read myself. I definitely don’t want to feel any kind of responsibility with Spandex or tick off a checklist of things I need to do. It is what it is, and yes, some areas are not represented or explored, but it’s often just a case of not having room. Spandex collects the first three issues of the series; do you have a game plan for the entire series and will Titan continue to collect it beyond volume one? In all, there will be 8 issues of Spandex. Issue 4 to 7 are a big story arc called ‘O.M.F.G.’ and hopefully that will be in Book Two, if Titan do one. In ‘O.M.F.G.’, the all-lesbian supervillain team Les Girlz attack Spandex, and the biggest secret in comics is revealed! After that, there will be a Spandex Special, which will wrap up the series. Titan could pop that into a complete collection, if they wanted to, or just release it as a one-shot or something. In the past several months we’ve seen Archie Comics, Marvel and DC use the introduction of homosexual characters for what feels like headline grabbing purposes. 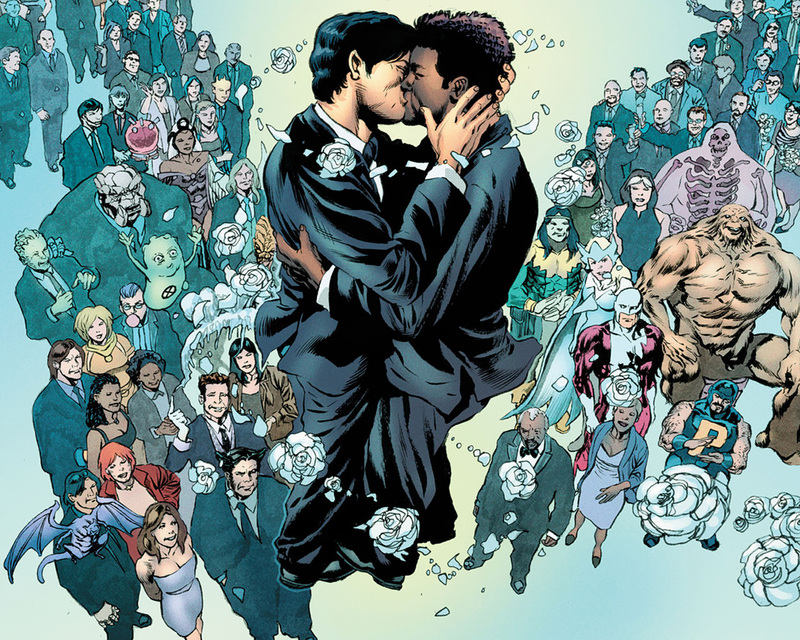 What are your thoughts on gay characters in mainstream comics and what did you specifically think about the way the Kevin Keller, Northstar’s wedding and Green Lantern Alan Scott storylines were handled? I didn’t know much about Kevin Keller – I just saw this really eye-grabbing issue #1 cover! It was only afterwards that I heard what it was about (Archie isn’t big here in the UK). I bought it and thought it was fun – although I thought he looked a bit ‘sinister’ and butch on the first cover, whereas he’s quite cute inside. I haven’t read the Alan Scott storyline, but I don’t think he’s really that major a character. From what DC were saying, it was as if Wonder Woman was going to come out. I read the Northstar wedding issue and it was okay. It’s nice to have that relationship, but Kyle is a bit dull. I thought it was a shame that the issue wasn’t a bit better, to be honest. It starts off in the middle of a confusing storyline, ends in a really confusing way, and in the middle, you have the wedding, which is okay. It was a great opportunity to bring in more readers, but I don’t know how successful this issue was in doing that. What creators and comics have been the biggest influence on your work? Story-wise, I think John Byrne’s 80s/90s influenced me a lot. He knew how to tell a good story, build up subplots and really mess around with characters. Neil Gaiman’s Sandman really influenced me, the way he built huge casts of characters and they just weaved in and out of the series. I like Grant Morrison’s crazy ideas and big shocks and beautifully constructed characters. Art-wise, I like the more classic illustration style, like Jill Thompson and Pia Guerra, and Jaime Hernandez is my ultimate favourite artist. I really like JH Williams III as well – stunning. Can you tell me a bit about your previous series O Men and your current plans to collect the series? What else do you have coming out? The O Men was a series I started back in 1998 when I was first trying my hand at comics. It got a good response, so I stuck with it, and later on I had got myself a nice little group of readers and some really good reviews. It’s an epic, superhero soap opera about a group of dysfunctional superheroes who have to fight a powerful enemy before she picks off them and their families. I decided to collect the series across five books, and the final book will actually be all-original material, as I haven’t even started the end of the series yet! So it’ll be an interesting and unique experiment – and a series that will have gone on for almost 20 years! With comics, I’ve mainly crossed over into manga. I just don’t find superhero comics very satisfying or value-for-money at the moment. I’ve been thoroughly enjoying Bakuman, which is really inspirational, and I’ve been checking out things like Gantz, Naruto and Until Death Do Us Part. 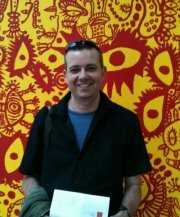 I also like indie stuff, like Love and Rockets, Optic Nerve and Dan Clowes. Musically, I like all sorts! It’s good inspiration for me – I just see Spandex scenes when I listen to music. I’ve been listening to a lot of Japanese music (Asian Kung-Fu Generation), I like BigBang (a Korean boyband lol) and I just discovered an amazing group called School of Seven Bells. They’re a mix of Curve, Saint Etienne and the Cocteau Twins, who are all amazing. I like really atmostpheric music and female singers, and at the moment I like Feist and Grimes. As for TV, when I’m at home, I’m usually always drawing, so I tend to just put something on that is a bit brainless or doesn’t need all of my attention, like Big Brother! I do really like The Big Bang Theory though. For a non LGBT comic reader who is hesitant to try Spandex, what would you tell them to convince them to check it out? That’s a good question and I must say that almost half of Spandex‘s readers (maybe more!) aren’t actually gay! It really just is a ‘normal’ comic – it’s exciting and fun and shocking. It’s just like classic superhero stuff, but for mature readers – and the characters just happen to be gay. It’s not a big deal – it’s just part of the story. Come on board!